The Internet is virtually awash with scare stories concerning Fukushima radiation along the Pacific coastline. The posts are rife with misconception, exaggeration and (sometimes) outright fabrication. There is one solid reason why none of them are worth the fonts in their postings. To put it simply, the evidence being used is grossly deceiving. People using hand-held radiation monitors showing a hundred or more counts per minute along the Pacific coastline make it seem the readings are due to Fukushima. While there are Fukushima isotopes to be found throughout the Pacific, the concentrations along the California coast are way too low to register beyond natural background levels on publically-available radiation detectors. One recently-popular YouTube video shows a detector’s counts-per-minute (CPM) going up as the person holding it gets near a Pacific coast beach. Beach sands contain a plethora of elements, and many of them have naturally radioactive isotopes, such as Potassium-40, Carbon-14, Rubidium-87, and Uranium-238/235. Beaches with low concentrations of these elements might not show an increase in its counts on a hand-held detector when approached, while others will demonstrate just the opposite. Did the person making the YouTube video ever monitor that beach before? Is it any different now than six years ago? There’s no way of knowing from the footage. 5 – Rubidium-87 = 700 million-trillion Bq. While 30 thousand-trillion (Fukushima’s number) is astonishing in-itself, when we compare it to the roughly billions-of-trillion number that occurs naturally, it takes the scare-factor out of the rhetorical equation. Opponents to nuclear energy like to use the Fukushima numbers in isolation from what we find in nature because it scares people and fulfills their antinuclear agenda. When placed in context, the scare-factor diminishes mightily. Here’s one of the most informative graphics I’ve seen depicting these facts. As the graphic shows us, there are fifteen billion-trillion Bq (15,350,000 PBq) of activity in the world’s oceans. The Pacific Ocean holds 51% of the world’s sea water. So let’s cut the world’s natural oceanic activity in half and say there’s roughly 7.5 billion-trillion Bq in the Pacific from Mother Nature. Further, let’s assume that Fukushima’s contamination is mixing with only that Pacific volume north of the Equator, so we have 3.75 billion-trillion Bq to use for our statistical purpose. 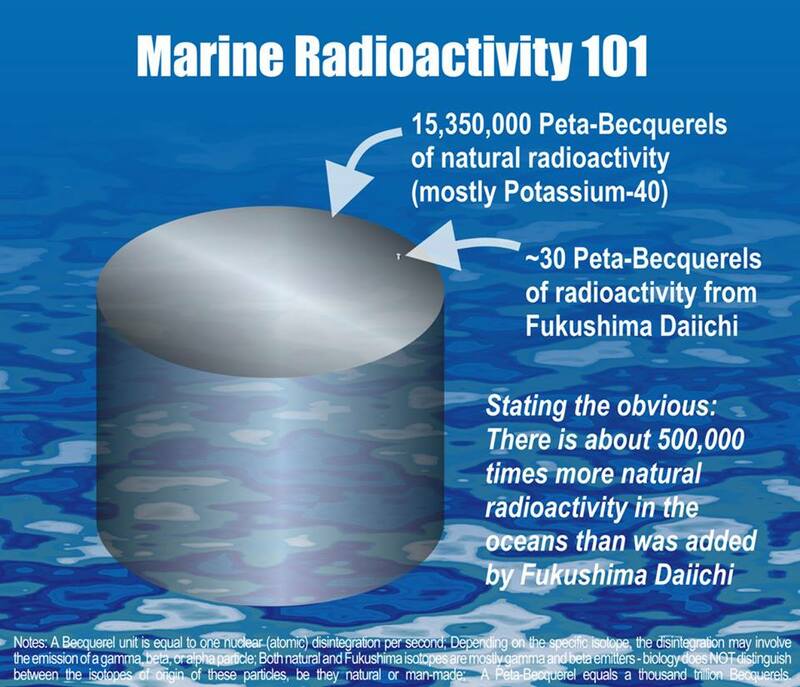 If we divide 3,750,000 PBq (Natural Pacific activity) by 30 PBq (Fukushima), the total of all Fukushima radioactive isotopes in the north Pacific is 125,000 times less than what naturally exists. This means that, on the average, one out of every 125,000 counts registered on the YouTube video’s hand-held meter might have come from Fukushima. In other words, we would have to watch the detector read out at 160 CPM (the highest I saw in the video) for about thirteen hours before we could confidently say that one of the counts may have come from Fukushima. This brings us to one of the problems faced by radiation-averse persons using their own radiation detectors for the first time. By and large, they are either not aware of or refuse to consider natural background levels with the locations they are monitoring. Further, they either don’t know or refuse to consider that it takes a constant, year-long exposure to many, many CPMs to produce a dose of one millisievert (Japan’s national standard for exposure). I know that converting from Bq to mSv varies with each isotope, depending on their different emission types and energies. What I’m doing is generalizing a conversion with respect to what we find with the buffet of natural isotopes found in sea water and in their sand beaches. Regardless, with only one out of every 125,000 counts on a hand-held detector being possibly due to Cesium-137 and/or Strontium-90 released from Fukushima, the resulting increase above natural background is so incredibly small that it is not worth considering. While it is true that appearances can be deceiving, appearances with respect to radioactivity can be monumentally deceiving!